High quality injection mold tooling for globally competitive prices. Despite the pitfalls of purchasing injection mold tooling overseas, many companies struggle to justify paying more for tooling that is made in the USA. Fortunately, customers of The ERC no longer have to make that choice. We offer globally competitive prices on high quality steel production molds for 400 ton presses and smaller. Our skilled toolmakers use CNC and EDM equipment to construct multi-cavity production molds from hardened steel to meet extremely tight tolerances. Unlike our prototype tooling, production molds are built from scratch and shipped to the customer. Our production tool offering is beneficial to customers who prototype with The ERC. Developing your prototype and production tool under one roof will ensure that the knowledge gained from the prototype is implemented into the final production tool. 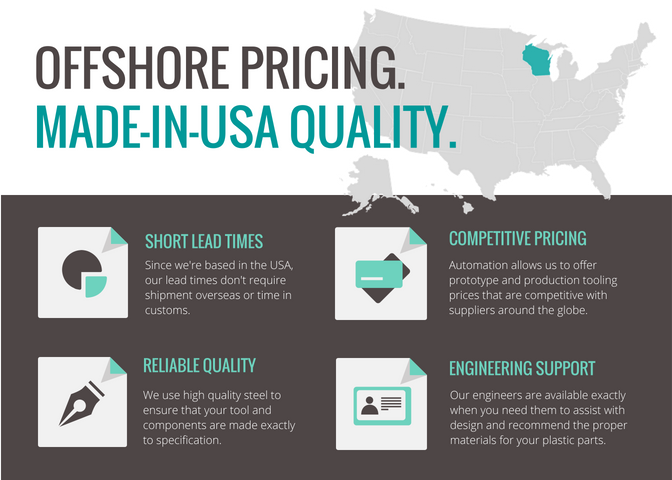 What are the benefits of purchasing tooling in the USA?